Disclosure: This is a sponsored post by Eva Trends. As always, all opinions are my own. The last piece I chose for my collaboration with Eva Trends is a black and white cardigan called Doodle Up Cardigan. I wear a fair amount of black and was right away drawn to the pattern. What's especially nice about the cardigan is that it has short sleeves that help hold it in place, yet it lets the clothes underneath shine. I first styled the Doodle Up Cardigan with a black turtleneck, jeans, a brown belt, brown boots and a brown bag. I also wore the Doodle Up Cardigan with an all black outfit and liked the interest the black and white pattern added to the outfit. If you want to check out Eva Trends, you can save 10% off your entire order by using Code MM10. It's a great website with very unique pieces, like the Girl in the City sweater I showed you here or the Snow Love Sweater I showed you here. But there are also beautiful dresses, pants, overalls, accessories, shoes and more. Question: What new piece of clothing are you thinking about adding to your wardrobe? Talk about a great cardigan, Andrea!! It's perfect for the warmer California weather too, but I like how you also layered it over long sleeves!! 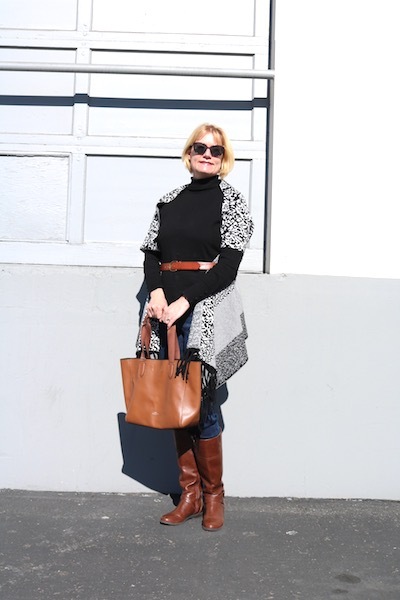 I love how you styled the black and white with the brown accessories, including the belt! Great look! Thank you! I love it with the brown, too. I like black and white. Great cardigan. That's a great cardigan! I love how you styled it with the brown boots! Thanks, Nancy! I love it with the brown accessories, too. That cardigan is adorable! So cute and cozy looking! I am always a fan of black and white! You can't really go wrong with black and white can you Andrea? 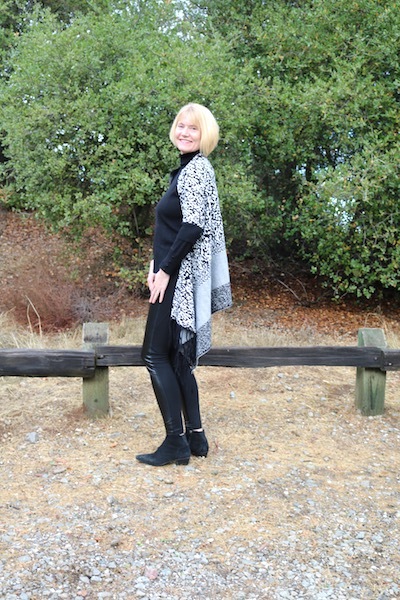 I love the unusual shape of this cardigan and really like how you styled it with the black ensemble. The cardi is so cute and look just cozy for winter. I love the tassels and how you styled this! Andrea, this looks so stylish on you! Love the way you styled it with all black and then the cognac accessories really stand out.